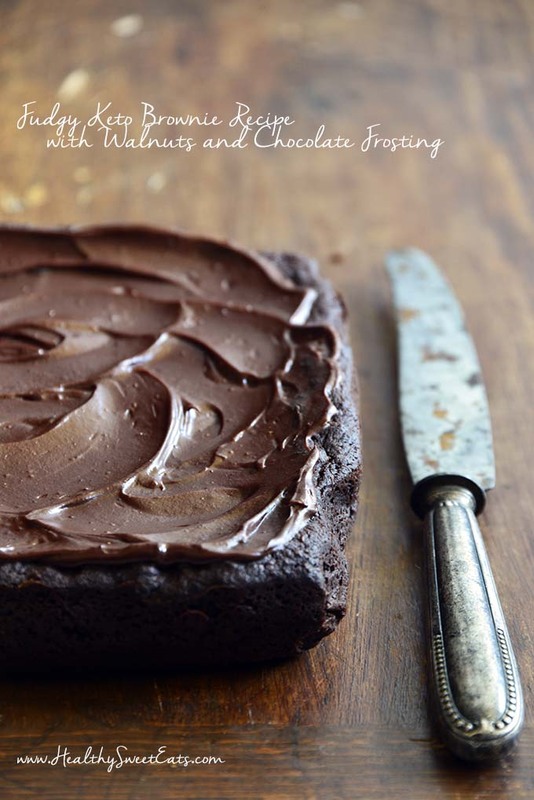 Brownie lovers living a low carb lifestyle, I have a real treat for you today. On my quest to find the best fudgy keto brownie recipe I did a lot of experimenting. I’ve used countless secret ingredients (like gelatin, flaxseed meal, and psyllium husk powder), endless variations of flours, and a combination of different keto-friendly sweeteners. Getting the right level of sweetness can be a bit of a challenge, especially if you’re using erythritol, which causes the cooling effect. Because of this, in this fudgy keto brownie recipe I used a combination of powdered erythritol (which generally has less of a cooling effect than granulated) and stevia glycerite, along with a touch of blackstrap molasses to cut the sweetness and add complexity of flavor. The sweetness level is only half the equation of the perfect brownie though; texture is just as important. 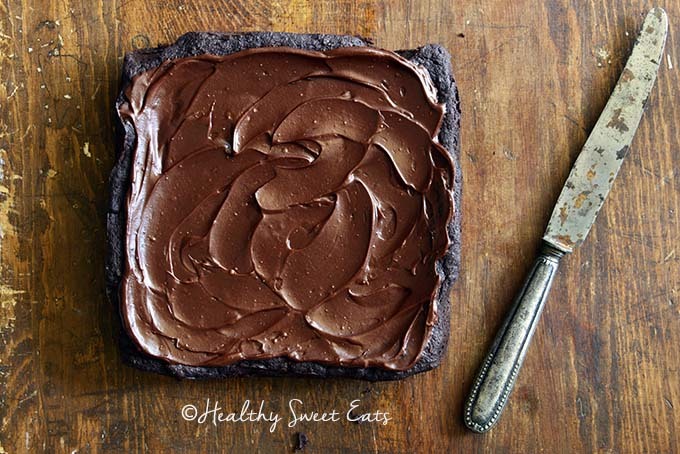 Almond flour is the base flour of this fudgy keto brownie recipe, and unsweetened cocoa powder also acts as a dry ingredient. But the real trick is chia seeds! The chia seed trick is something I can’t take credit for. A while back I saw a recipe for keto brownies on Low Carb Maven. The recipe was actually adapted from a cookbook by Martina Slajerova from the KetoDiet Blog. Low Carb Maven noted in her post that the brownies aren’t actually fudgy as the name states, so I reworked the recipe a bit and came up with the best fudgy keto brownie recipe I’ve ever had (check out my recipe here), and then I tweaked it a bit here, adding nuts and frosting. 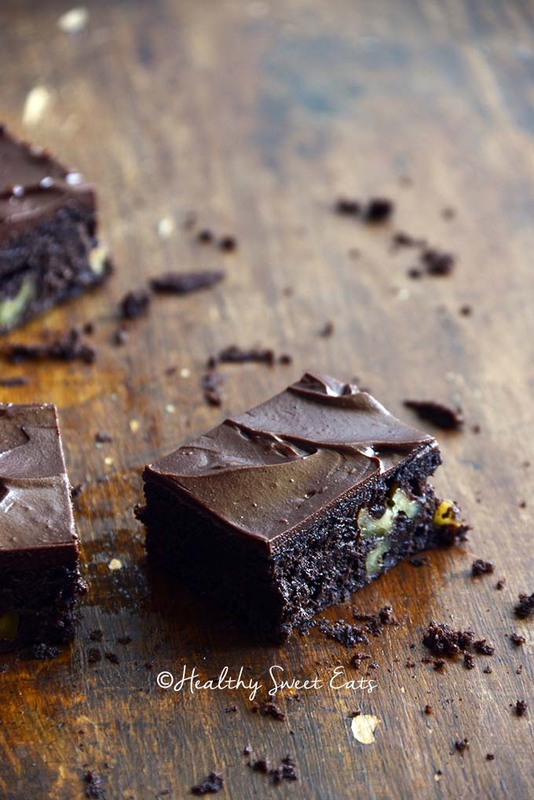 These brownies are intensely chocolaty and richly fudgy. They’re fantastic as-is and the chocolate frosting on top is just a bonus; feel free to leave it off if you prefer! When you realize just how easy it is to make incredible brownies from scratch, you’ll never buy a boxed brownie mix again! Before I started cooking low carb and keto, my favorite recipe for homemade brownies was Alice Medrich’s famous Cocoa Brownies. They’re rich and fudgy with great texture and gorgeously crinkly tops. Her method involves mixing melted butter with sugar, eggs, flour, and cocoa powder, and it’s proof positive that sometimes the end result is much greater than the sum of its parts. In this fudgy keto brownie recipe, I use a similar method. Lots of cocoa powder for deep chocolate flavor, but additionally I add 90% dark chocolate. And then to keep these brownies keto, I add healthy fats in the form of grass-fed butter, organic heavy whipping cream, almond flour, and chia seeds. 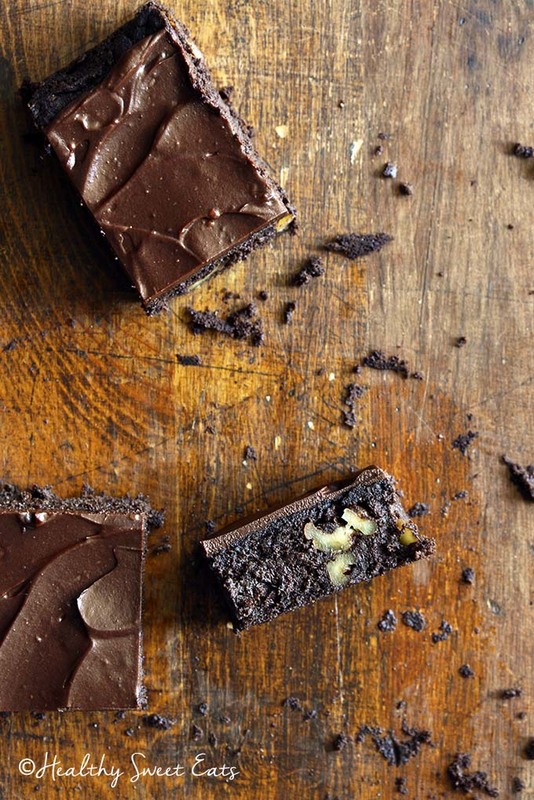 The method to make these homemade brownies couldn’t be easier. The dry ingredients get mixed up, and then the butter and chocolate are melted and combined with the other wet ingredients. Finally, the wet ingredients are mixed into the dry and the batter is baked. 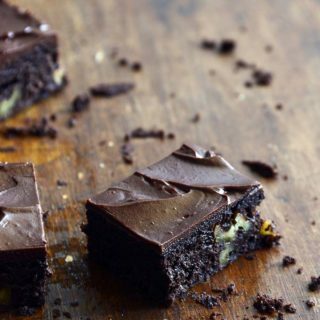 Most people have a very specific type when it comes to brownie preferences, whether it’s cakey, chewy, or fudgy. The difference isn’t in the ingredients because most brownies contain some form of chocolate, sugar, eggs, and flour. Rather, the difference lies in the ratio of ingredients. For example, adding more eggs yields a lighter, less dense brownie. Incorporating more flour results in cakier brownies. Recipes that call for more fat, whether it’s in the form of butter, oil, or chocolate, generally mean brownies will be chewier or fudgier. Additionally, I noticed that when you use a higher ratio of fat to flour and then use less flour and slightly more cocoa powder, the result is a fudgier brownie. 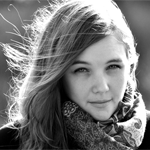 Do Brownies Need Baking Powder? 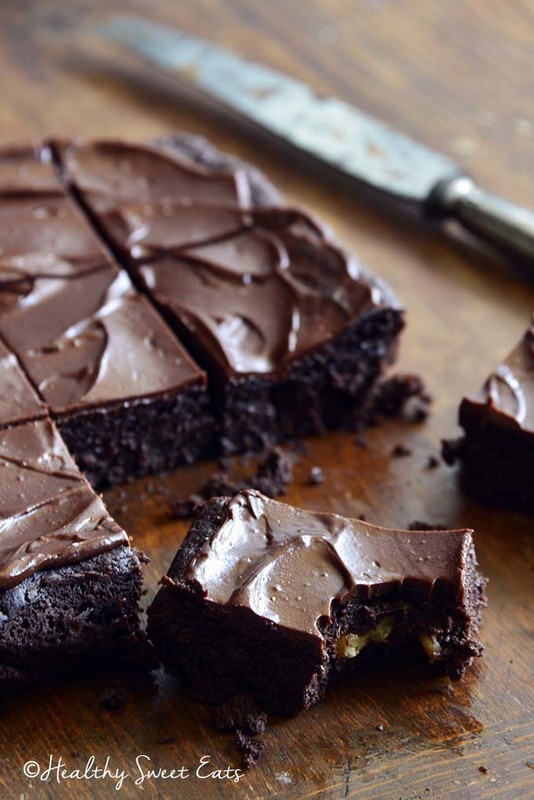 Many brownie recipes don’t need a leavening agent, such as baking powder or baking soda. It depends on what type of brownie you’re going for (e.g., fudgy, chewy, or cakey). Additionally, it depends on the other ingredients in the recipe. 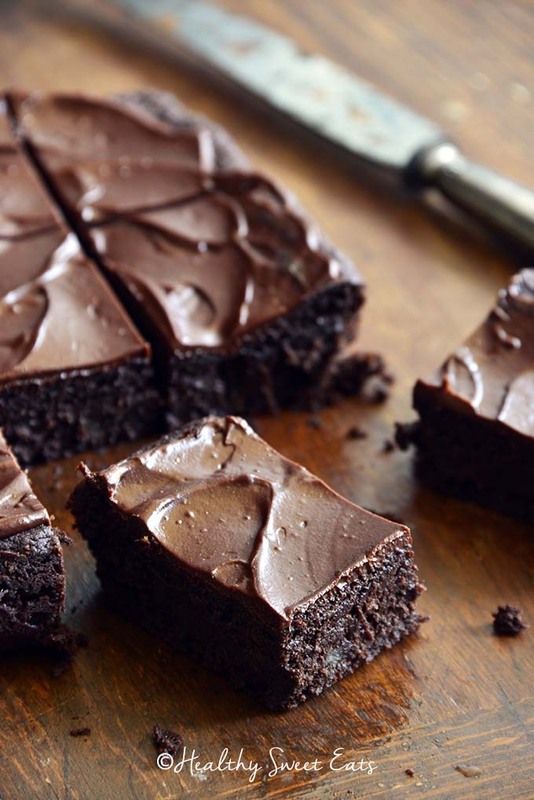 Skipping the leavener is actually a trick that helps yield fudgier brownies. However, this doesn’t mean you can just omit baking powder or baking soda from a recipe that calls for it. If a particular recipe calls for baking powder or baking soda, be sure to follow that particular recipe because it was tested for best results. In this fudgy keto brownie recipe, I used baking soda as a leavening agent. This helps yield the correct texture for these brownies because low carb baking is a bit different than classic baking due to the lack of sugar and gluten. Pour the wet ingredients into the dry and stir to combine; fold in the walnuts. Spread the batter evenly into the bottom of the prepared dish. Bake until the brownies are set along the outside, but still gooey in the center, about 17 to 20 minutes. For the frosting, melt the chocolate, butter, and cream together in a bowl in the microwave or double boiler. Cool slightly, and whisk in the Swerve Confectioners, vanilla, stevia glycerite, and salt until smooth. Let it cool to room temperature, stirring occasionally (it will thicken as it cools), and then refrigerate slightly until it’s spreadable like frosting. When the brownies are cool, spread the frosting on top. Let the frosting stiffen slightly (you can put it in the fridge if you want it to stiffen faster), and then cut and serve.